memory. Yeah, thats it. After years of being told videogames make us dumberer, Japanese neuroscientist Ryuta Kawashima, a professor at Tohoku University, has possibly sussed out how to reverse the process. 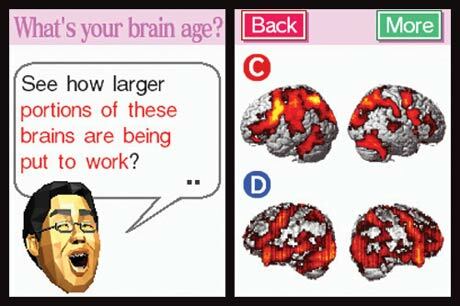 After his research revealed gamings dumbing-down dangers, Nintendo funded development of new DS handheld title Brain Age, a multi-million-selling hit in Japan, especially amongst the baby boomers and senior citizens. Designed for daily "workouts, a series of tests determine your cerebral age  20 is tip-top shape  and then uses Kawashimas theory that doing math problems, reading aloud, memorisation and other mental mini-games increases blood flow to your brain, making it healthier and younger. Then maybe youll remember where the hell you put the damned DS.